How did human language become so structurally complex ? This dissertation presents evidence that complex syntactic rules in modern human language emerged via a pre - syntactic stage that was governed by semantic principles . This dissertation investigates the influence of meaning in evolutionarily early language by looking at situations in which people cannot use or learn a language normally . The systems that arise in those situations are called restricted linguistic systems , and examples of such systems are the language of unsupervised adult second language learners and home sign . 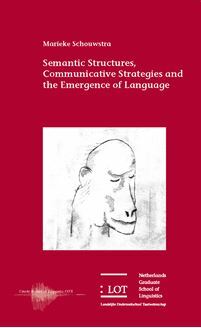 This dissertation relates observations from restricted linguistic systems to a novel approach taken up in the laboratory , in which participants are asked to communicate about simple events using only gesture and no speech : improvised communication . Together the two branches of evidence constitute a picture of evolutionarily early language in which semantic principles take a central position : they precede and ultimately drive syntactic rules . Because of its interdisciplinary approach , this book targets a wide audience , and it will be relevant to linguists ( and non - linguists ) interested in meaning , language and evolution .